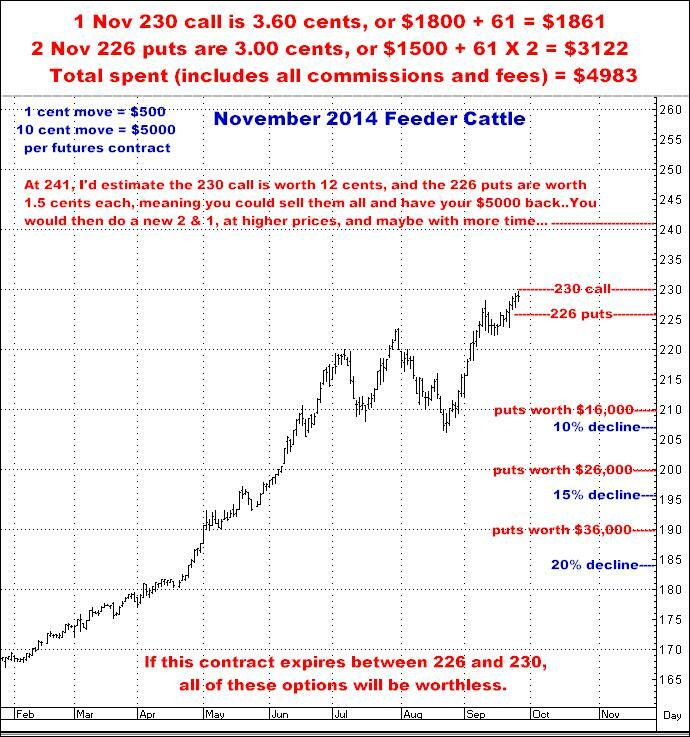 I think the opportunity in Feeder Cattle just becomes more and more incredible. At some point…and I continue to believe it is any given day now…this market WILL have its top tick and I absolutely believe this “quiet” event will be followed by AT LEAST a 25% break in the few months following. 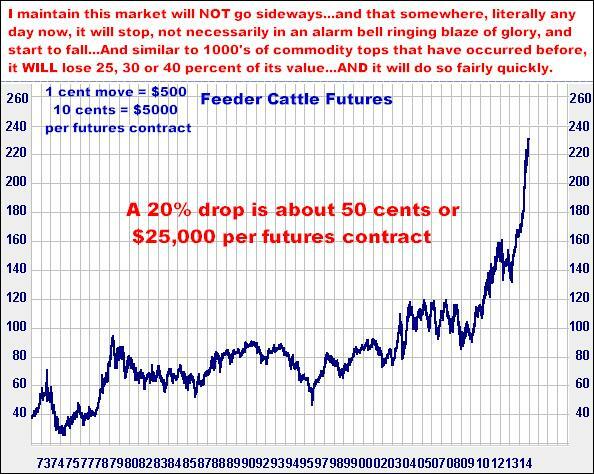 As “sideways’ is rarely a word I would use to describe Feeder Cattle futures, even in “normal” times, I think the odds of this market going sideways at current levels are almost nil. Obviously, anything can happen in futures, but from here, at these truly stratospheric record highs, I say this market is either going sharply higher, or sharply lower…NOT sideways…And no, I DON’T think it is going higher…or I wouldn’t be going short…but I do recognize that Feeders can still continue to rise. BUT, even if it does go higher from here, as I said before, there WILL be a day that is the top tick…and from there, I think the downside potential is going to be in the many 1000’s of dollars per contract. So the trick is to make sure you are still on the trade when that last high is made…which to me is just a matter of using the “2 & 1” and doing some very simple math…And thereafter, when that high trade has been made, the main thing you will need to do is just stay short and resist the urge to “get out too early”. I ALWAYS LIKE TO BE STRAIGHT UP AND TELL YOU I DON’T KNOW WHAT IS GOING TO HAPPEN IN THE MARKETS, AND WHEN I AM WRONG IT CAN MEAN LOSING MONEY, BUT I DO THINK THIS IS A MONSTER, MONSTER SITUATION. Here is, I believe, a great way to risk $5,000…and truly have a shot at turning it into 6 or 7 times that…OR be in position to recoup the 5K and reposition at even higher levels. One of the hardest things about this business is being wrong…and then having to summon the energy to get people to believe that now you are about to be right. I am human. I get discouraged by being wrong but I try to never allow myself to lose sight of the fact that a great trade is still a great trade…and that just because you have been “early” does NOT mean you give up on an idea. The numbers are still what they are…and I am 150% sold on the idea that this trade is soon going to happen. Maybe “soon” is this week…or maybe it’s a month from now…but I also 150% believe that you have to be in the position before the collapse begins, the point being, I am in this NOW and I will be staying in it. I DO SEE THIS MARKET EASILY TRADING 50 OR 60 CENTS LOWER (OR MUCH MORE). I DO THINK IT BEGINS ANY DAY NOW. I DO THINK THE 2 & 1 SHOWN HERE IS DEAD ON PERFECT FOR THE SITUATION. AND I DO SAY THE NUMBERS I SHOWN YOU HERE ARE NOT “PIE IN THE SKY”. THIS IS THE REAL DEAL. AS MY WALL REMINDER SAYS: ONE GOOD TRADE IS ALL IT TAKES….but you have to put your money on the table to be there when it does happen. Call me. This IS for real.